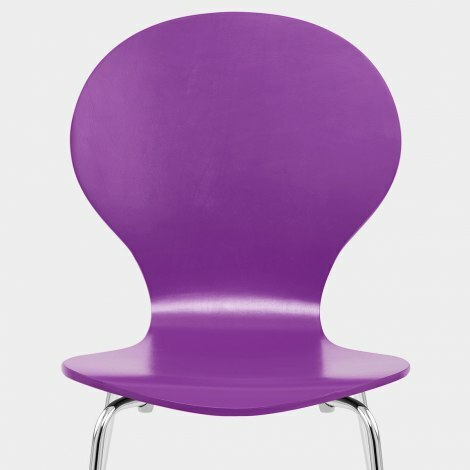 Sure to catch the eye, the Candy Chair Purple is a fabulously funky piece guaranteed to liven up its surroundings. With a vibrant design sure to revitalise any room it is placed in, the Candy Chair is the perfect multipurpose piece for the home. Fashioned from solid wood with a satin purple finish, its distinctive rounded shape will lend an undeniably modern look, wherever it is used. Set on a quartet of polished chrome legs, each boasts a protective rubber plug beneath to help minimise marking to floors. Last but not least, the Candy is stylishly stackable for compact storage, making it a highly practical piece that will not disappoint. "The comments I get are great. Well done Atlantic"
I bought four chairs which were delivered within a few days ,and I was kept informed throughout. The chairs arrived and were well packed . They were easy to assemble with clear and precise diagrams. The comments I get are great. Well done Atlantic.